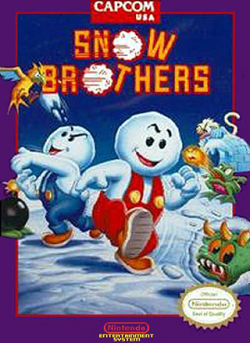 Snow Brothers is an arcade style action game released on the Nintendo Entertainment System. We take a look at how well an old game like this plays today. This particular game was released in 1990. If you’ve played Bubble Bobble, the style of game will already be familiar with you. The story involves a princess who was kidnapped. The protagonists, Prince Nick and Prince Tom, are the only ones who can save her. Unfortunately, they have been transformed into snowmen. In spite of their altered forms, they set out to rescue the princess by climbing the tower. Each floor contains a set of monsters. Sometimes, they are goblins. Sometimes, they are those blue tornado trolls. Regardless of what the player encounters, defeating the regular monsters is a fairly straight forward process: hurling snow at them until they become snowballs. The player then kicks them down the course until they inevitably hit a wall, taking them out. After taking monsters out, there are occasional potions that help the player along. Some potions allow the player to run faster, other potions enable the player to throw snow farther. Once the player defeats all the monsters on a particular floor, money cards fall down that can give the player a higher score. These cards only last a very brief limited time, so time is of the essence to collect as many of them as possible before the player advances to the next floor. As the player advances between floors, players will find that there are a number of bosses they can meet along the away. One boss is this round thing that has cannons that shoot walking bombs. It has the ability to go invisible as well and warp between one location and another (well, between two locations of the playing field anyway). Another boss are two flying birds that swoop down and attack you as well as drop eggs on you in the process when swooping down at you isn’t enough. In any event, the idea of beating them is similar – pelt them with as much snow as possible and kick baddy stuffed snowballs their way. Bosses can take a lot of hits, but they can eventually be taken down. In total, there are 50 floors to beat before you encounter the final boss: two statue’s that breathe bubbles at you. If you get hit by one, you’ll end up being trapped in a bubble and get sent into a roof full of deadly spikes ready to impale you. If that wasn’t intimidating enough, some of those bubbles contain a fireball that will easily melt you down to a useless puddle. If you are successful in defeating these statues, you’ll rescue the princess and the prince hero’s will be transformed back to their normal selves. One feature of this game is the slot machine bonus round. Beat a number of levels and you’ll have a chance to play for extra free lives. This is critical since you are more than likely going to burn through those lives as you progress through the various floors. Another noticeable feature is the weird pit-to-roof wrapping. Many levels contain holes in the floor that correspond with a hole in the ceiling. Fall through one of those holes and you’ll magically appear falling through the roof from the top of the floor. That neat little shortcut can be your only way to get to the top of the floor and hit a few baddies perched up high in some area’s. The challenging part is the fact that everything that can hurt you will kill you. You don’t take damage and survive in this game, you operate on a one-hit-kill basis. Another challenging factor is the fact that you have a limited amount of time to complete any particular level. If you take too long, a tentacle pumpkin headed monster appears that is invulnerable. The only way to avoid the monster is to either complete the level in a reasonable amount of time before it arrives or try and jump around to avoid it while you track down that last straggling monster that refuses to die and take it out. Personally, I thought this was an interesting way to kill a few hours. It’s not the worlds longest game, but it certainly can be quite enjoyable. It’s not one of those older games that are next to impossible to get any reasonable distance in, but it isn’t a cakewalk either. It’s quite a challenge to actually get to the end of this game. Sometimes, you’ll have no choice but to just die if you get boxed in by a hurricane monster. Graphically, this was decently well done for a NES game. It not only had interesting textures, but some levels even had general art embedded into the actual level design so as to not be too plain with repeating textures. I thought that this was a nice touch. the art of some of the bosses was also kind of neat a well. The game also ran reasonably smoothe as well. The music was nicely done as well. The first two songs are somewhat similar, but the music varies after a while and can be quite enjoyable as you mash the buttons. While the sounds are straight forward, it manages to not get annoying in any way. So, I thought the sound effects were well done as well. Overall, this was a good game. It’s not a game you sit around and play for days, but it is a nice little distraction that can last several hours. This game is also very approachable after a few months of playing other games or doing something different. I wouldn’t hesitate playing this multiple times – especially if the replaying is nicely spaced out. Furthest point in game: Died on the final boss. Could probably replay it and defeat the final boss, but thought I had a good understanding of what the game was like by the time I got that far in the game.